There is nothing better than buying a game on a whim and finding a true gem that quickly rises to be one of your all time favourite JRPG’s. 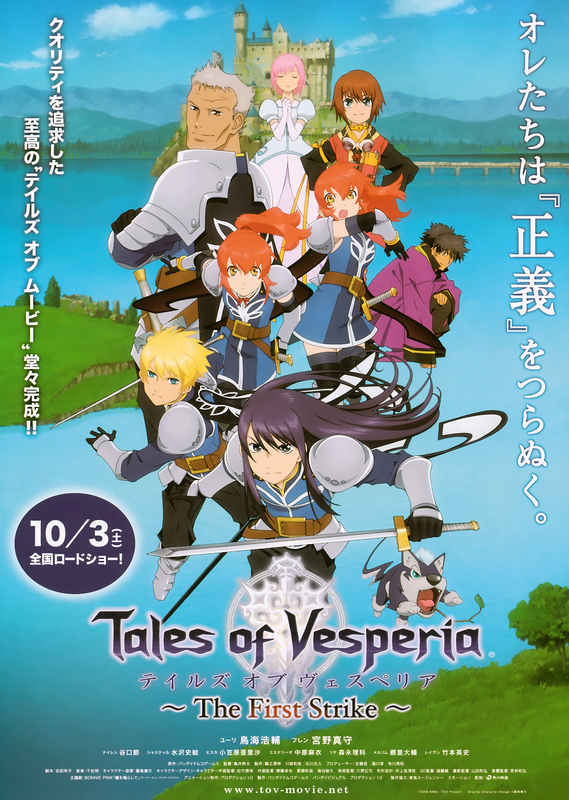 Tales of Vesperia accomplished this before I was aware of the long history the franchise had. Here’s the opening of the game to tease you a bit. 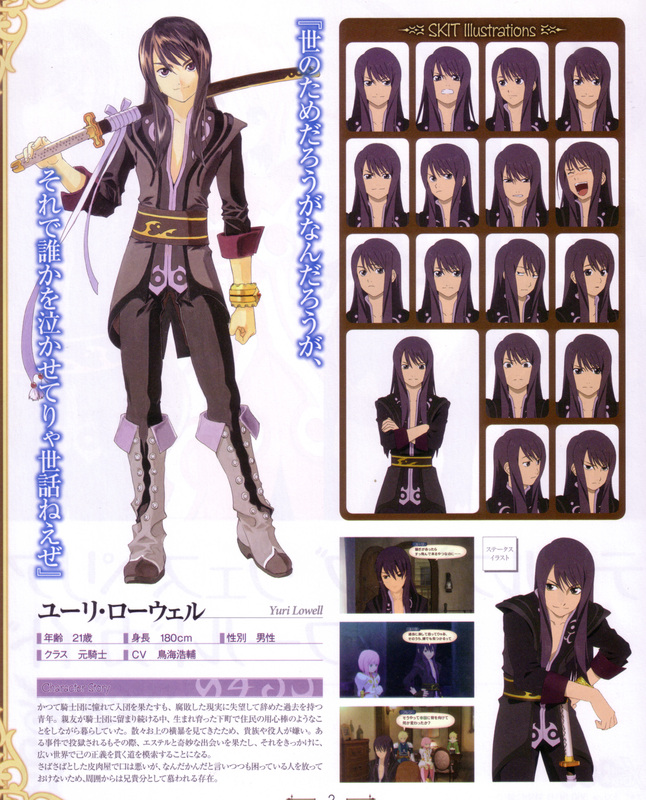 Tales of Vesperia is a great rpg in every sense of the word. The characters are memorable due to their uniqueness but also because of how relatable they are to the player. The combat system is simple enough to jump into but gains more depth and complexity as the game goes on and allows the player to play in a myriad of ways that can accommodate almost any preference in fighting style. 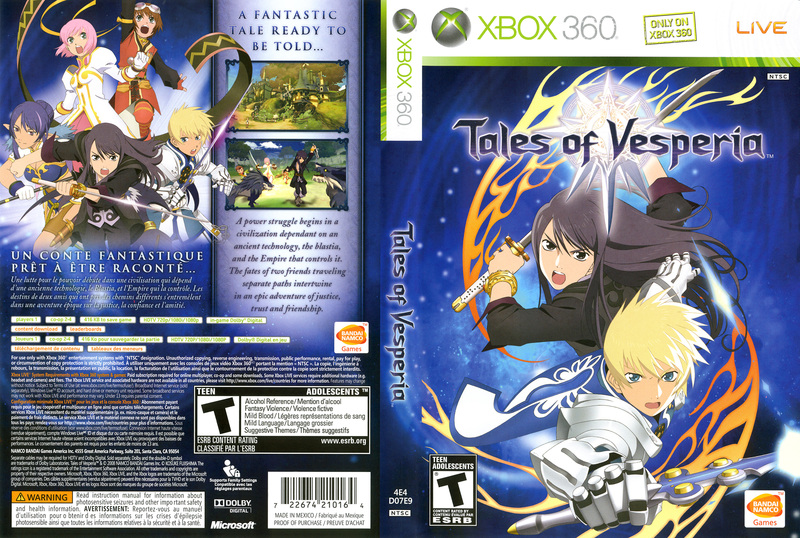 Another thing that makes the “Tales of” game stand out is their voice acting and Vesperias VO is great, all the dialogues feel smooth and coherent and all of them feel that they were recording with all the actors in front of each other making them feel natural. The story starts out simple enough but becomes a grand adventure more grand and involved than anything the game can hint of in the beginning of the game. The world is also a joy to explore, having giant monsters to hunt down that present great challenges for those who love them. As a whole the game is excellent, worthy of the time of any jrpg fan and a game that even non jrpg fans can come to enjoy. So one of the great things about this game is that all the main characters are memorable in some way, this may not be the case with every character in every tales game but in this case they really do seem to stand out from each other. He’s the protagonist of the game and one fo the few characters that i have found that is actually very relatable. He has a very down to earth personality and reacts in ways that a normal person would, he’s not some stoic badass or some overly emotional sob story, he’s human and truly feels like it. There are few male characters in video games that I can say I have enjoyed playing as and he was one of them. Yuri’s companion from many years before the game and a silent witness to everything that happens. 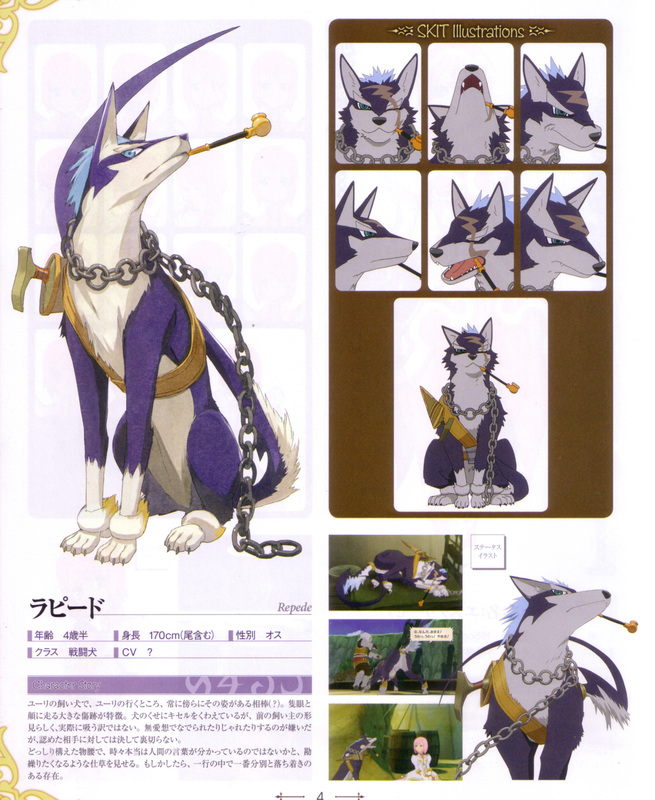 Repede gets our attention for several reasons, he and Yuri have a very deep connection, he fights with a dagger, and constantly has a very distinct pipe in his mouth. His story is very intertwined with Yuri’s and rarely is seen without him but the game (at least the american release) doesn’t explain much and leaves the player in the dark for the most part. He’s likable as a character and is obviously very intelligent and skilled making him an interesting addition to the game. 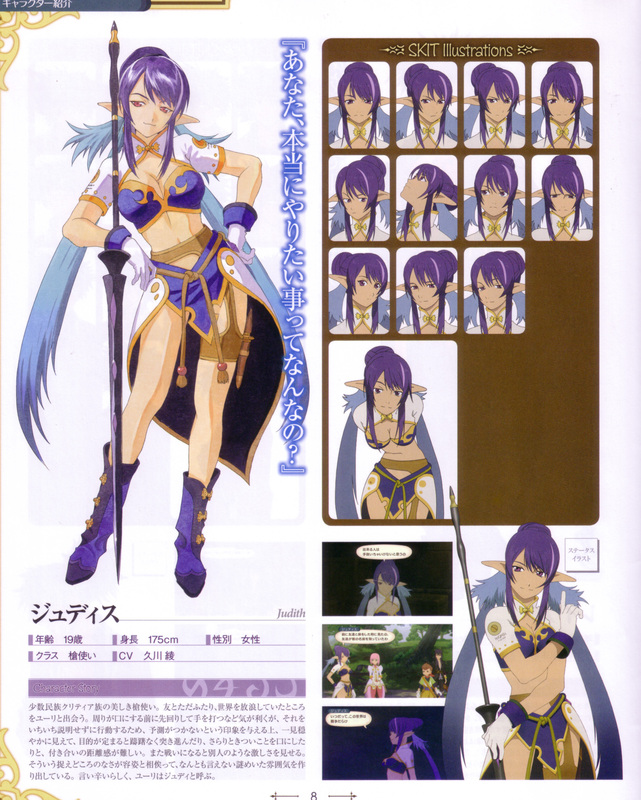 She’s our second protagonist and the main plot point in the game in one form or another. She’s our typical princess who has never left the castle and is anxious and oblivious to the outside world except what she has read in books. In the beginning she just seemed like the usual oblivious royalty that acts as a sort of comic relief but as the story goes on she starts to develop some depth and start to stand out as a character, and while she’s not entirely oblivious as to the workings of the world she does have plenty of occult knowledge from the more obscure books in the royal library. 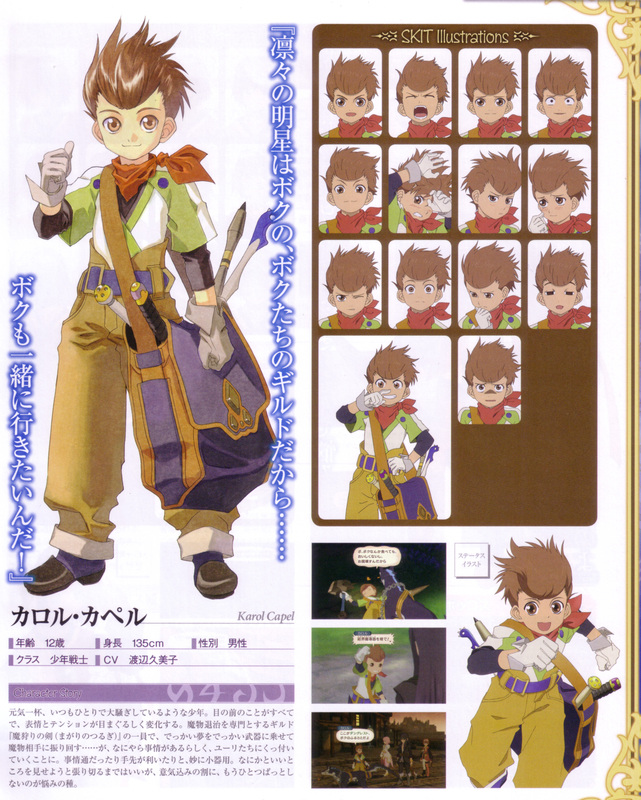 The fourth main character in the game one that shows true character development throughout the game. At first Carol seems to be the youth that joins up with the party because he has something to prove but as the game progresses we see that not only does he pull his own weight but that he also becomes central in the story of the party and instrumental in their future. 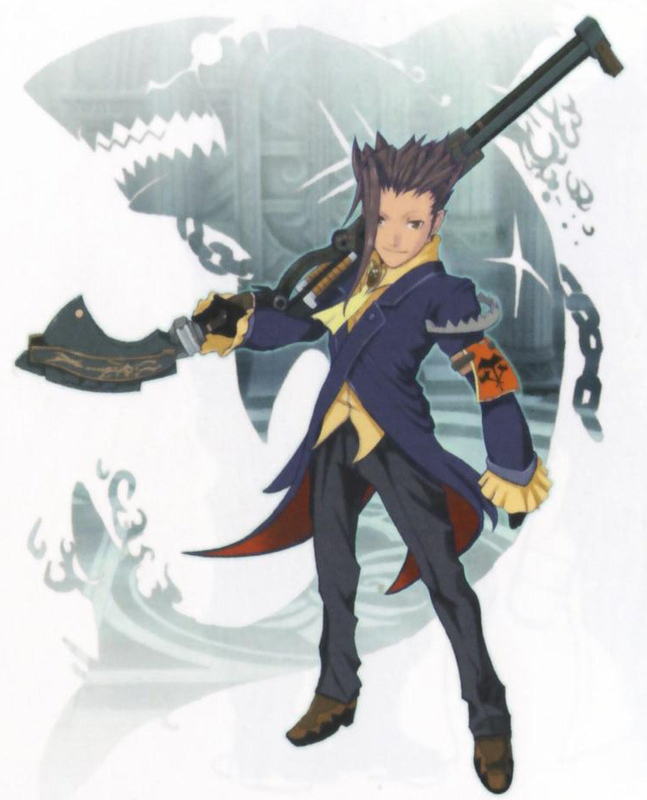 He also acts as a gateway to some interesting side characters and a very important one later in the game. 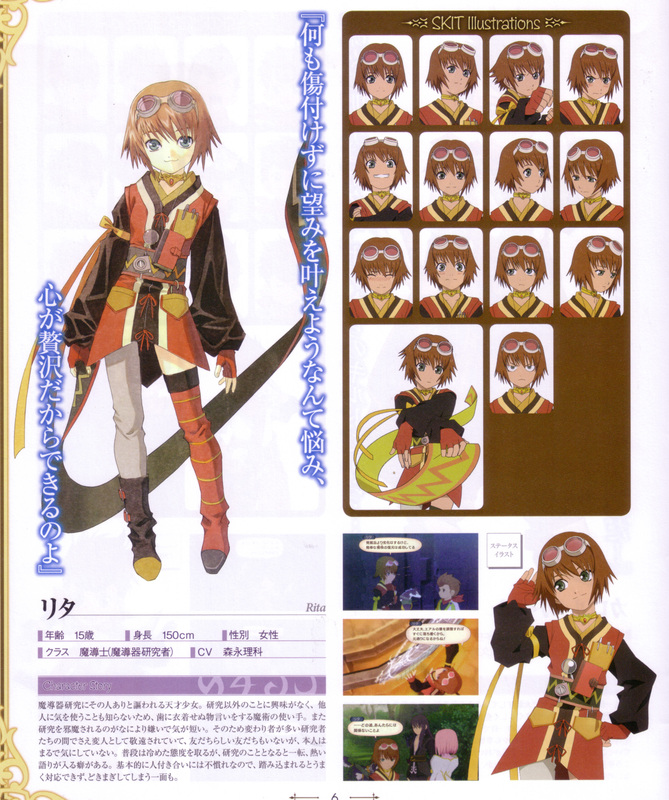 Rita is my favourite character of any Tales game that i have played so far and what convinced me to buy the game in the first place without any knowledge on what it was about. 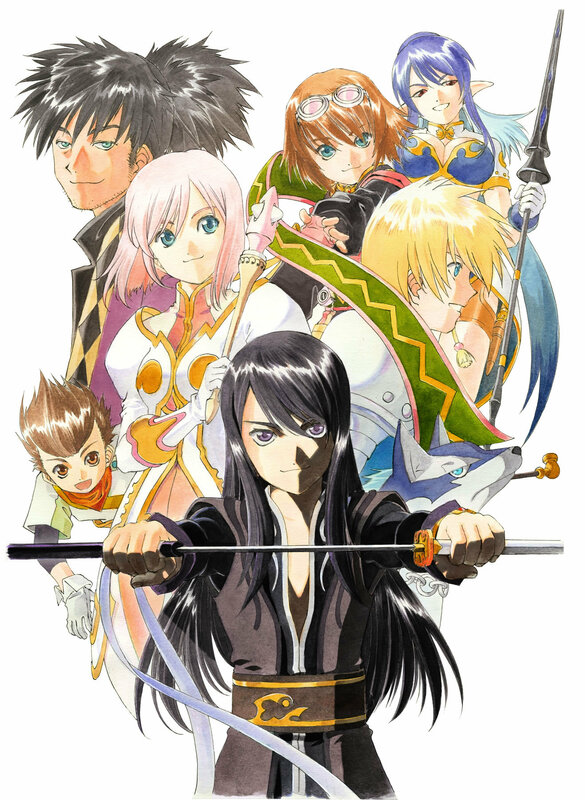 so being an anime fan i was instantly drawn to it so i pick it up and turn it around to see what it’s about, and i catch eye of Rita at the top and i was like…”Sold”, and i really do owe her a lot because since then i have played more Tales games and they are exactly my type of game. He is actually the most interesting and intriguing character in the whole story. He is very aloof and lazy but also very secretive and full of surprises. As the story goes on were only given hints and teases of his story and they are so very intriguing that it really is a shame that his story goes untold in the game. Probably the most interesting character story wise and one that should have had more exposition within the game. Judith the final member (in the american version) of the party and one that i feel gets very little character development and exposition. Where only told that she is a member of some hidden tribe or such and that she has a mission of sorts to complete but outside of those 2 things i can’t remember anything else about her. I may have missed something while playing through it, or they might have added more in the “International” re-release but as far as i know there really isn’t much to her. While there are many villains in the game i can honestly say that there is only one villain that i truly remember. In the beginning he acts as the main villain, always scheming and showing no morals when it comes to his actions and there consequences. It is only near the end of the end of the game that we learn his true motivations and that everything he did was for a specific reason that flips your entire opinion of him. 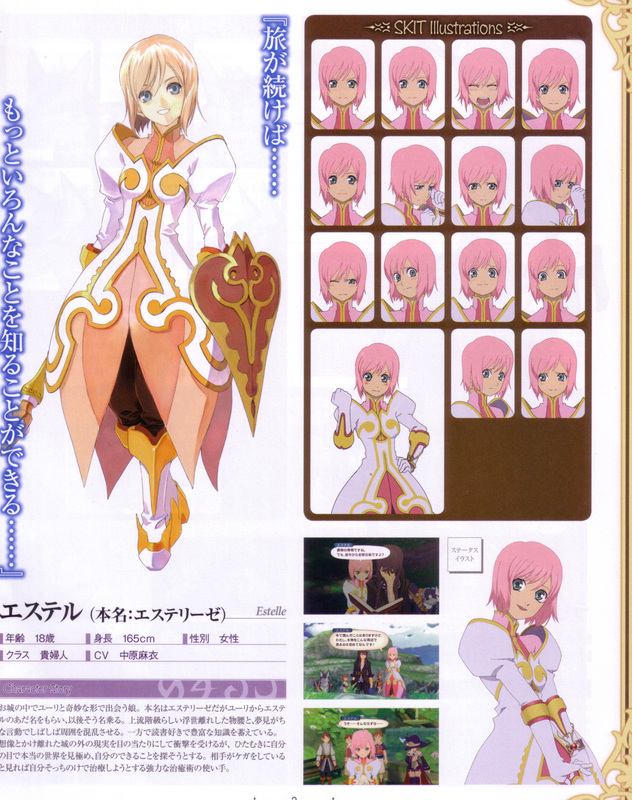 If you have played any other Tales of game then you know what expect from the battle system but if you haven’t keep reading. The world as a whole is very good-looking and enjoyable to explore with lots of chests spread around to find, lots of enemy variety, and a great soundtrack. 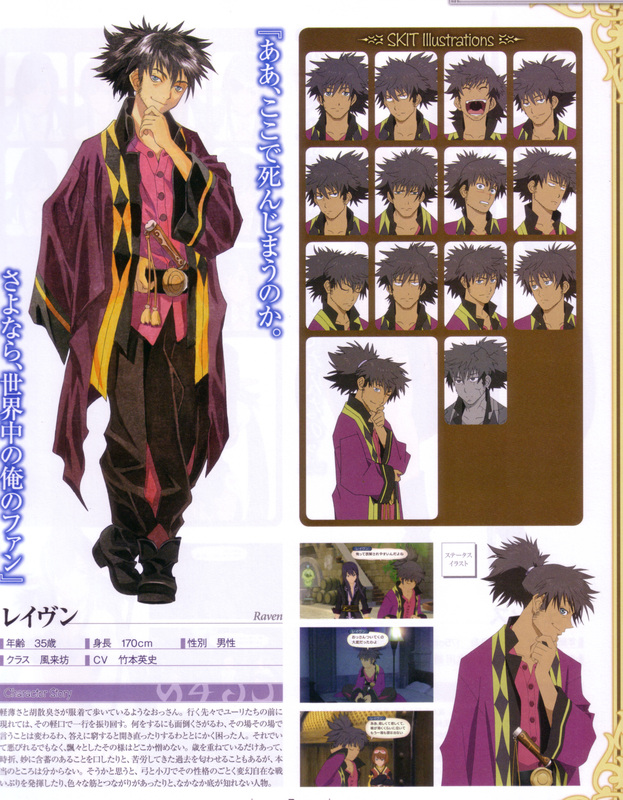 This OVA answered a lot of questions and gives us a deeper look into Yuri and Flynns relationship as well as give a little bit of fan service, the good one i mean, when were also shown Raven, Repede and Rita being…well, Raven, Repede, and Rita. It is a joy to watch and it ties in a great way with the games story. If you have a chance to watch it do so, but it has a lot more weight if you finish the game first. And there you have it, and mini-thesis sized review for a game that I think sets a bar for any rpg. If you like JRPG’s then you can’t go wrong with it and if you’ve never tried one then this is a good place to start.